For the backyard plinker or the competition shooter, CCI® has what you need. For accurate, extremely consistent ammunition the only option is CCI's Competition, Target and Plinking line. 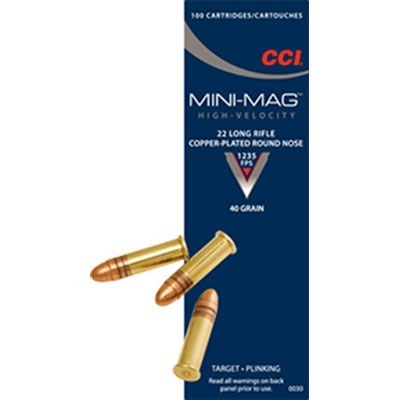 We offer a variety of affordable loads and calibers ideal for each discipline and fit perfectly for popular rifle, pistol and semi-automatic shooters. And they're loaded to ideal velocities for the best performance. This is definitely worth a closer look. You must be 18 or older to purchase shotgun or rifle ammunition and 21 or older to purchase handgun ammunition. All ammunition must be shipped Domestic Ground. Shipping not available for International residents. Residents in CA, DC, DE, IL, MA, NY, CT, NJ and OH may have additional restrictions. Always make sure you use the correct ammunition for your firearms. Check your state and local laws for any other applicable firearms and ammunition regulations. Due to Department of Transportation regulations, we cannot accept returns on ammo. Please check local laws before ordering. View full restrictions here. Ammunition pricing is per box. Brownells is still shipping ammunition orders to California but the process has changed to comply with California Proposition 63. We must now ship ammunition purchased online to an FFL or California-approved ammunition dealer. After placing your order, a Brownells representative will contact you to ensure your ammunition arrives quickly and in compliance with the law. Learn how to purchase a firearm online. Please choose from the available options to purchase an item.